An election would lead to secession and that would lead to Civil War. For four long hard years, over 700,000 citizens of the United States of America would perish in an attempt to solve the state's rights issues surrounding slavery. 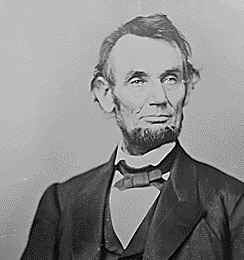 They would fight across the nation at battlefields such as Gettysburg and Vicksburg with the Confederacy finally losing the battle due to attrition and bold decisions by Abraham Lincoln to emancipate the people enslaved. It was a decade that saw the binding together of a nation that looked as if it would forever be two, and that possibility existed if not for the leadership and bravery of all involved. 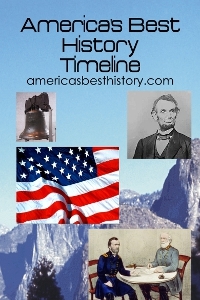 Now in easy to search digital format for your Kindle, Nook, or pdf format. Also comes in paperback, too. National Park Service sites are made available for your enjoyment of the history and recreation opportunities there. Please take time to keep your parks clean and respect the historic treasures there. 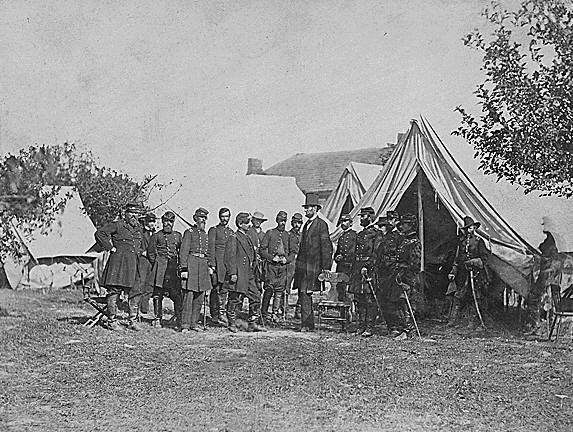 Photo above: President Lincoln and his generals at Antietam after the battle. Courtesy National Archives. Photo above: President Abraham Lincoln. Courtesy National Archives. 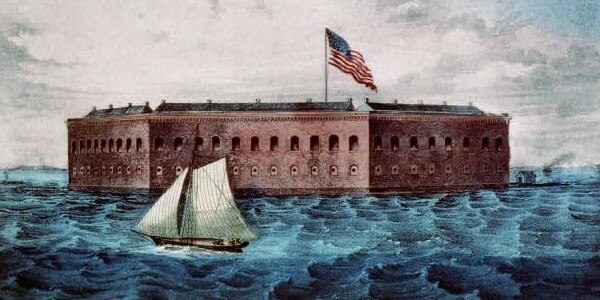 Right: Lithograph of Fort Sumter. Image courtesy Library of Congress. December 4, 1867 - The Grange organizes to protect the interest of the American farmer. Today, in most cases, you mention an organization with the original name that includes Patrons of Husbandry and you might get a curious look; either that or a segment on a program about relationships. However, in 1867, two years after the final year of Civil War, the organization that would be founded had little to do with men and women in marital cohabitation, it had to do with securing the financial well-being of America's farmers after the devastation of war, both in the south and other parts of the nation. It would be the oldest farmers and rural public interest organization in the United States. The National Grange of the Order of Patrons of Husbandry, its official name, was organized as a fraternal organization by Minnesota farmer Oliver Kelley. It was founded with the motto, "I Pay for All" with images that extended that statement to "I Feed You All," a reminder that the goals of the farming families in the initial group were goals that benefiting the nation. They would advocate for advanced methods of farming, lobby for lower railroad rates that would transport their goods, and other goals at both the state and federal level. Kelley, although born in Boston, had moved to Minnesota and become a successful farmer in a region dominated by the Indian trade. He parlayed his bold use of irrigation and mechanical means into a position in the Department of Agriculture. Spurred by the success of the Masons, Kelley decided that a social organization that would benefit farmers specifically, not only in social matters, but political, was called for. 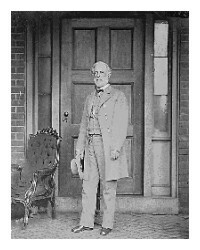 His trips into the South, where war effects and outdated farming practices predominated, convinced Kelley that the organization was not only called for, but necessary for reconstruction. By November 15, 1867, the groundwork for the organization was laid. Local granges would be an important part of the organizaiton. Grange #1 was founded in Fredonia, New York in 1868 by Kelley and seven others. Kelley would be the national association's secretary until 1878. By the 1870's, membership in the Grange Order soared in all sections of the country, but especially the Midwest and South. Membership grew to one and one half million members (other sources state lower figures below one million). Grange halls and chapters sprung up in most farm towns. In Ohio alone, there were nine hundred chapters. Local grange associations began to provide machinery, in shared exchanges, to assist individual farmers, and grain elevators where they could store their goods without paying the high price that the railroad company would charge for storage silos. Women and children were allowed to join with the Future Farmers of America established under the Grange umbrella. Women would be allowed to vote on Grange issues long before universal Women's Suffrage would be established in 1920. However, after the Financial Panic of 1873, the Grange began to wane in popularity, with membership dwindling. They had been devastated by increased rail costs, lower crop prices, and Congressional measures backing gold and silver versus paper money. Their original assertion that farmers were central to the social and financial girth of the nation was under siege. The diminished strength, however, did not end its reach. Over the next decades, their efforts would succeed in establishing Granger Laws in five states, and although it is argued whether these were particularly effective, they continued to prompt legislation protecting small business interests at the state and federal level, including the Commerce Act of 1887, the Sherman Anti-Trust Act of 1890, the Pure Food and Drug Act of 1906, and that Universal Women's Suffrage. Membership stabilized after the turn of the 20th century. Today, the National Grange has chapters in two thousand two hundred communities. It is headquartered in Washington, D.C., on a block adjacent to the White House, and their headquarters is the only private building in that proximity. The building was dedicated by President Eisenhower on June 29, 1960. The Grange had been located in another location in the District of Columbia since 1924. Membership today includes over one hundred and fifty thousand members. Today you can also visit the Oliver H. Kelley Homestead in Elk River, Minnesota, which is a Minnesota Historical Society living history farm. A total of sixty Grange buildings across the United States are listed in the National Register of Historic Places. 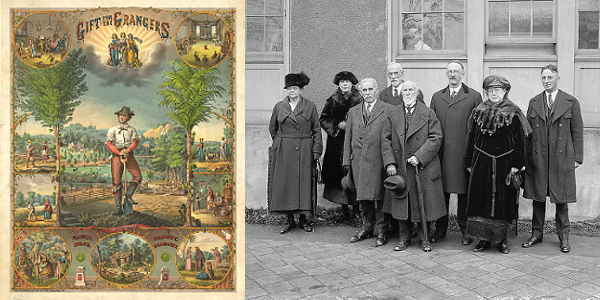 Image above: Montage of two images about the Grange Association; left, lithograph named Gift for the Grangers, 1873, Strobridge and Company, Lithographers; right, National Grange Group, 1923, National Photo Company. Courtesy Library of Congress. 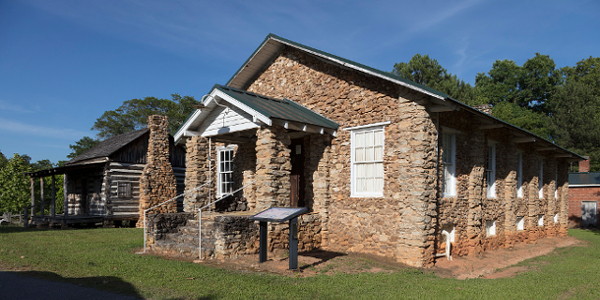 Below: Grange Hall in Donalds, South Carolina, 2017, Carol M. Highsmith. Courtesy Library of Congress. Info source: Gilderlehrman.org; Library of Congress; Ohiohistorycentral.org; History.com; Nationalgrange.org; "Rich Harvest," Dennis Sven Nordin; Wikipedia Commons. 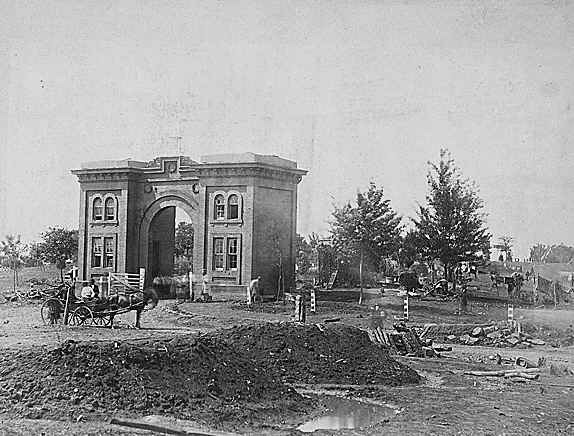 The Cemetery Gate at Gettysburg after the battle. Courtesy National Archives. 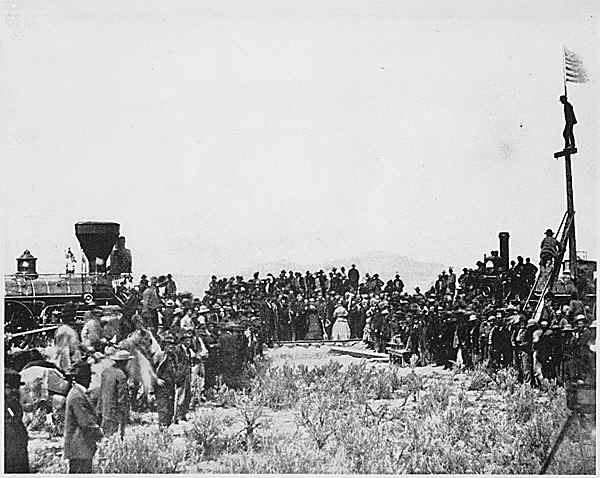 The spike at Promontory, Utah of the Transcontinental Railroad. 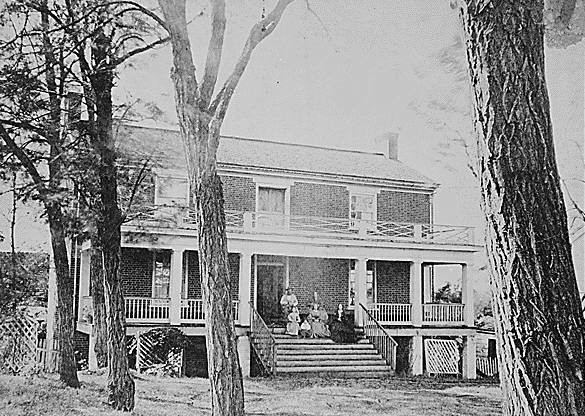 McLean House, the Civil War surrender site at Appomattox Courthouse. Courtesy National Archives.